The original Planet of the Apes movie was a movie that launched four sequels, a live action tv series, and even an animated show. The movie begins with four astronaughts traveling in space. They crash land on a planet many centuries in the future and are unsure of their exact location. 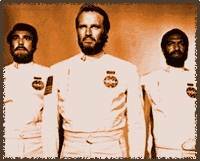 Taylor as played by Charlton Heston leads the group onto this strange world. He has only two fellow astronaughts as one female died during their travels. Taylor notices how similar this planet is to Earth. It supports life and appears a bountiful garden full of life. But will any of this life be intelligent. 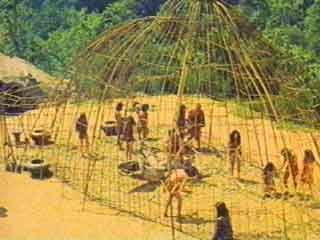 Taylor and his crew discover primitive humans eating from the trees while acting more like beast than man. If this is the best this world has then it appears these three astronaughts will be running all afairs here shortly. Horses are heard and Taylor looks up and sees a Gorilla on a horse. It apperars that this Planet is ruled by Apes. The story progresses slowly but surely. Nonhuman primates run everything here. Gorillias, Chimpanzees, and Orangautauns can speak and even walk upright. Human beings on this planet are treated like cattle and are not much more brutish than cattle. Gorilla soldiers use humans for target practice and round up those they don't shoot to be put in huts like prisons. Human Beings are a thing for the zoo on this world. Taylor is seen as a threat by the council of Ape City. 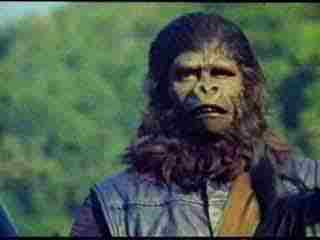 Lawgiver Zaius, an Orangautan knows full well the history of man's former dominance but defends and furthters the lie that Apes have always been dominant over man. All of Taylor's companions are lost except his new found primitive female mate Nova; only with the help of chimpanzee doctors is Taylor able to escape the wrath of this world. As the movie ends Taylor learns something startingly. In the horizon by the shoreline he sees the head of the statue of liberty. It becomes apparent that his travels in space led him back to Earth in fact and this planet was his home. He knows in his heart that nuclear war ruined his world and allowed this Apes to take control. APJAC Productions,Inc. and Twentieth Century Fox Film Corporation. Humans are shot for sport by Gorillas and rounded into zoo like enclosures. 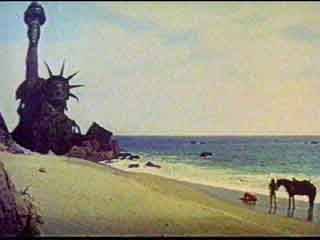 In the end it becomes apparent that this Planet of the Apes is actually Earth in the future.